Staying true to the traits of a capital city, Bern has a magnificent Renaissance styled Parliament Building, considered a national monument and the seat of the Swiss Confederation. 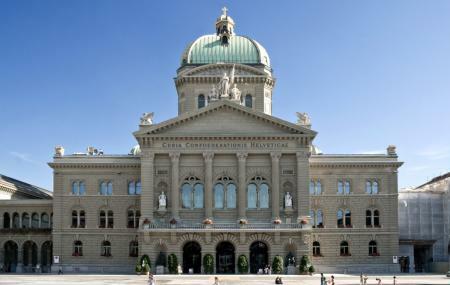 Rife with symbolism, the 26 fountains on the premises of the federal building each stand for one Swiss canton. The interiors of the parliament building house the coat of arms of all 26 cantons, in addition to two murals and statues that represent the swearing of the oath. Access to the Bundeshaus is only possible through a guided tour; depending on your choice of language, the tours are conducted in 5 languages, check the website for the schedule and be on time. Carry a piece of ID. Tours in different languages are conducted at different hours. How popular is Federal Building? People normally club together Barenplatz and Gurten while planning their visit to Federal Building. We went on a great English language tour that covered the building as well as some basic Swiss history, culture and government. The building itself is very beautiful, with lots of stained glass and murals. There's also an outdoor terrace with places to sit and a great view over the city and out to the Alps. There's free, you have to book ahead on line. English on Saturday at 2. A very beautiful building which has a height of 96 meter, same as the St Stephen Church, two tallest buildings at the Pest side, there is a law in Hungary that no building in Pest can be higher than 96 meter because no one can be above God and government. A very interesting fact about Budapest. The Parliament building is stunning during both day time and night time, but at night, when the lights are on, it is very beautiful. You can pay a small fee to visit the inside of the Parliament building, the free tour tour guide said it is worth it. It's a Government building which is open to public. Anyone can access the place freely. It has got the world class security and that's the reason they allow public here..
Beautiful parliament building, open to public. You can have a stunning view of the city from the back side of the building.